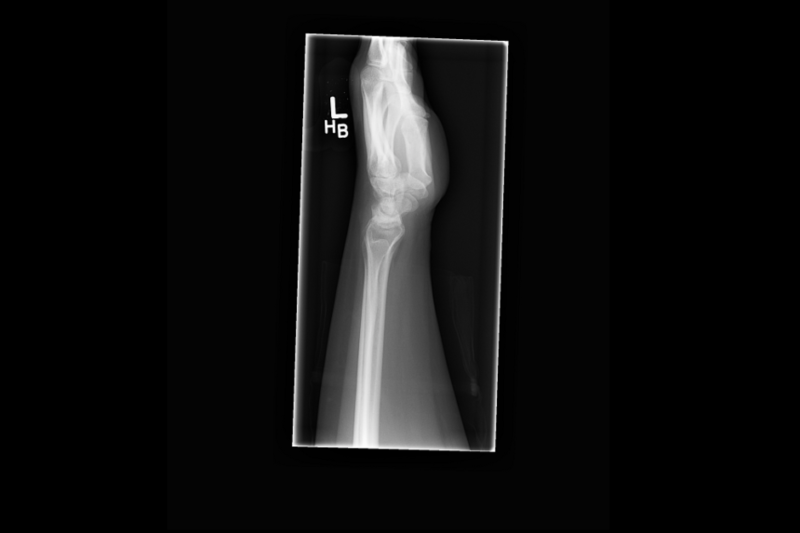 A 21-year-old woman presents with a 2-year history of left wrist pain. She believes the pain started when she injured her wrist lifting weights, but she is not certain. On examination, she has tenderness to palpation over the dorsal wrist and a slight decrease in wrist extension compared with the contralateral side. 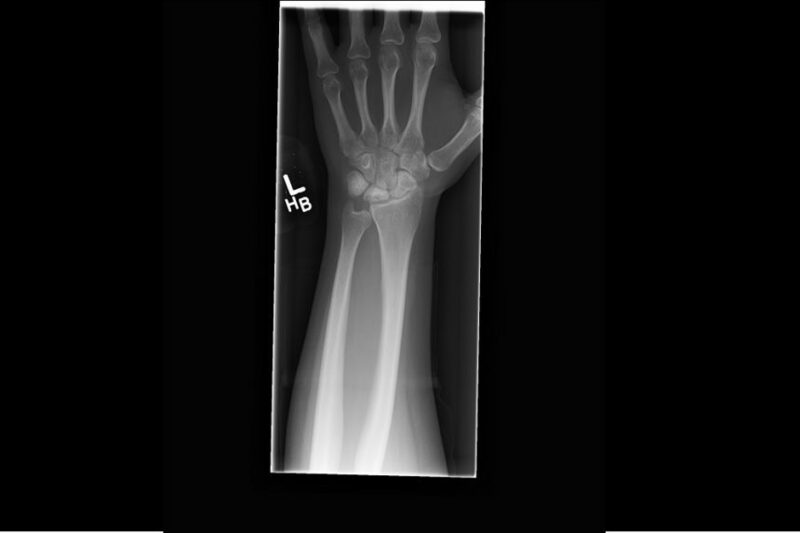 Anteroposterior and lateral X-rays (Figures 1 and 2) of the left wrist show moderate collapse of the lunate. Coronal MRI image (Figure 3) shows avascular necrosis of the lunate with subchondral collapse and fragmentation. The patient presents with avascular necrosis of the lunate consistent with Kienbock disease. Kienbock disease can occur as a result of trauma, skeletal variations such as ulnar minus variance, and diseases that disrupt blood supply such as sick cell anemia and lupus. Pain is usually activity related and located over the radiocarpal joint. Early in the disease, X-ray findings will be normal and MRI will show reduced vascularity. 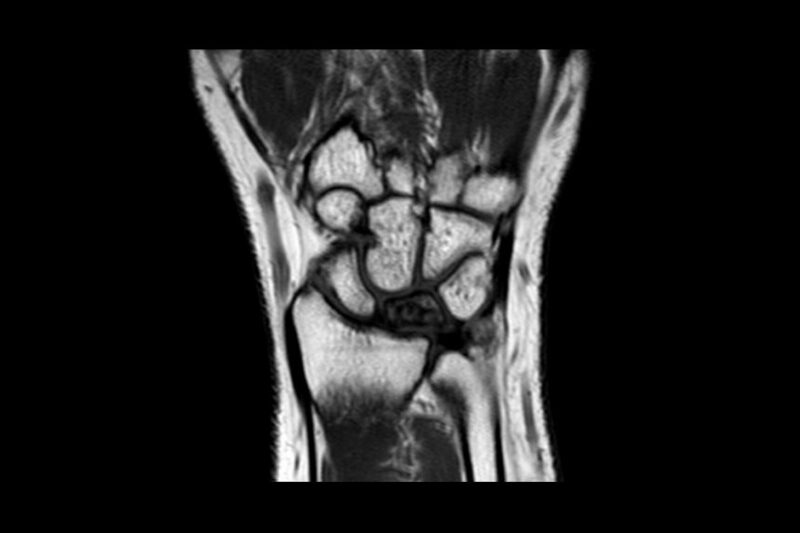 As the disease progresses, the lunate becomes sclerotic and begins to collapse, and degenerative changes occur in the wrist. Early disease can be treated with immobilization and NSAIDs, although further progression is expected and surgery is usually required. Patients with ulnar negative variance may undergo a joint leveling procedure such as a radial shortening osteotomy. Radial shortening osteotomy helps prevent disease progression to degenerative collapse of the proximal row. In advanced disease, a more invasive procedure such as a proximal row carpectomy, wrist fusion, or wrist arthroplasty is necessary. Ollier disease is a condition characterized by multiple benign tumors called enchondromas that develop within bones. Freidberg disease is characterized by avascular necrosis of the second metatarsal head. Panner disease is an osteochondrosis of the capitellum and is usually seen in pediatric overhead-throwing athletes. Karadsheh M. Kienbock’s disease. https://www.orthobullets.com/hand/6050/kienbocks-disease (Accessed January 16, 2017). Watanabe T, Takahara M, Tsuchida H, et al. Long-term follow-up of radial shortening osteotomy for Kienböck disease. J Bone Joint Surg Am. 2008;90:1705-1711.